Been feeling a bit low for the last week. I think it’s that whole brand new year thing where everyone is all pepped up and ready for anything, ready for a great big change where all the bad times are over and only the good times will be allowed to roll; and then you realise what a challenge that will be and it all seems completely exhausting before it even starts. Obviously, the answer is one day at a time. Baby steps. 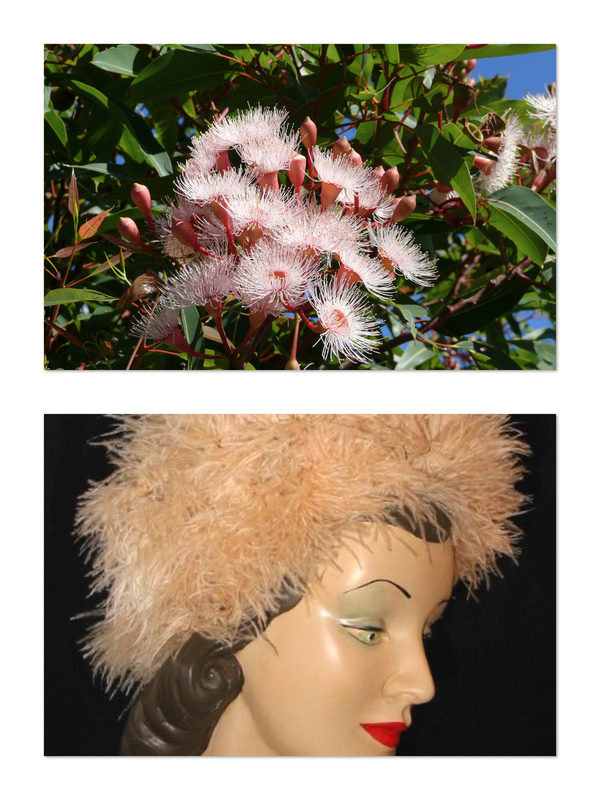 I think this pink flowered eucalypt looks so like a vintage couture hat, complete with ostrich feathers. This hat definitely looks like a group of lily pads. You’re certainly making a statement when you wear it. And it’s very GREEN. This is a building in King Street, Newtown which always strikes me as looking like a German Officer’s cap from World War 2. I am sure that building comes to life at night and marches around the streets. This is a hat that looks like a cat (or maybe a teddy bear.) It’s not the cat in the hat, it’s the cat that looks like a hat. This photo looks like two things. It’s a photo of the umbrellas at the fish markets with the Anzac Bridge in the background. 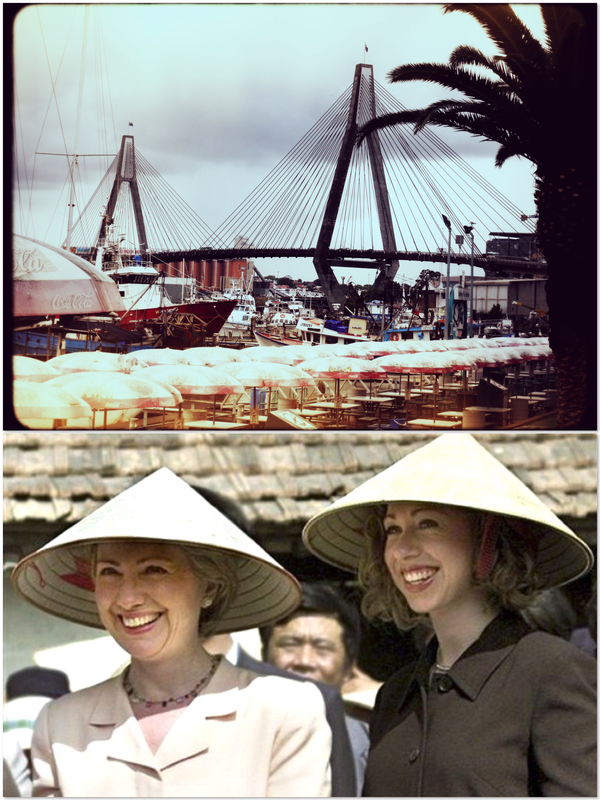 I originally had it matched to workers in the rice fields in Vietnam who were wearing those conical hats, but then I saw this photo of Hillary and Chelsea Clinton and couldn’t resist. But do you see it? Do you? The hats look like the umbrellas AND the bridge. Things that look like hats for the win. You should try matching up some of your photos to things that look like something else. It really is a lot of fun. You should try it, Mags. If anyone would be good at matching things up it would be you. You are an expert at finding unusual videos and images. It’s so much fun. I had a great laugh! Hahaha – wonderfully creative Selma 🙂 Your group of lily pads reminds me of an old fashioned swimming cap my mum had – which had rubber flowers all over it – haha! 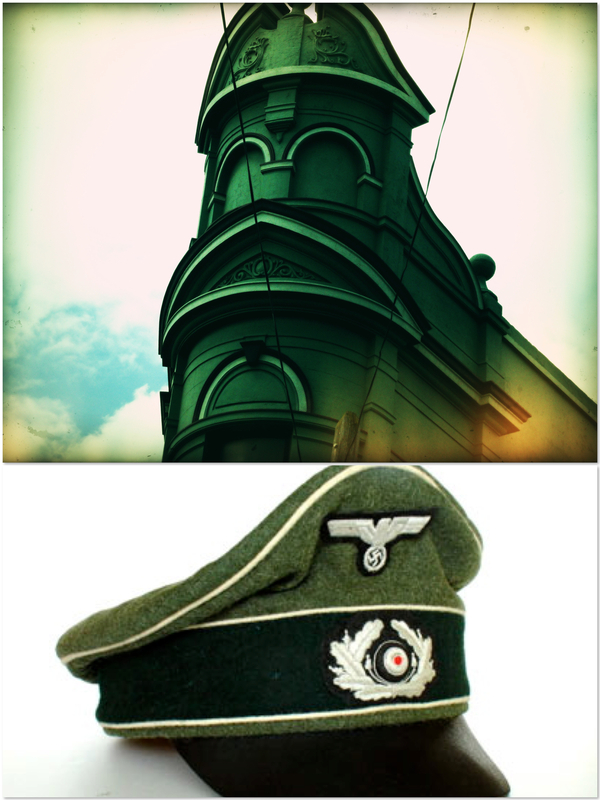 That building looks so much like an Officers cap – wow. I DO see the umbrellas and the bridge looking like the hats – two for the price of one. I felt a bit blar after Christmas too but I think for me it is just too many weeks of kids at home and me out of my routine (and I eat and drink to much so feel unhealthy and guilty) – I am looking forward to the new school term. Hope you feel better soon. My aunt Jo had that same cap, Gabe. It had pink and white flowers on it. I’ll never forget it. When she was under water and resurfaced it was like watching a bunch of flowers emerge from the water. Hilarious! I know what you mean about the post-Christmas period. It is a bit blarariffic! I remember when the Ford Ka first came out … we likened it unto a cycle helmet. And, the Pizza Hut logo reminds me of Paul Hogan’s ‘Crocodile Dundee’ hat. Yes. The Ka definitely looks like a cycle helmet. I’ve often wondered if you feel squashed while driving one – they don’t look very comfy. The Pizza Hut logo is like his hat. Well spotted! Good for you girl. Silliness and laughter make the blahs disappear quickly. I love the eucalypt flowers, they look so exotic. I have recently looked into the different sorts of flowers that occur on the eucalypts and they are gorgeous. You wouldn’t expect it – these great, big trees with their lovely flowers. I’ll get some photos together for you! Ahh are they things that look hats – or hats that look like things? Now that is the question. LOL. Great to see you, John. Hope you had a great festive season! I know what you mean about the New Year doldrums. I suffer from it myself (which perhaps explains my most recent PK&M post). Some of it is about resolutions, I think. I don’t make them anymore. They are such a recipe for failure and guilt. But then there’s the guilt at failing to make some resolutions and even trying… Gah. You can’t win. 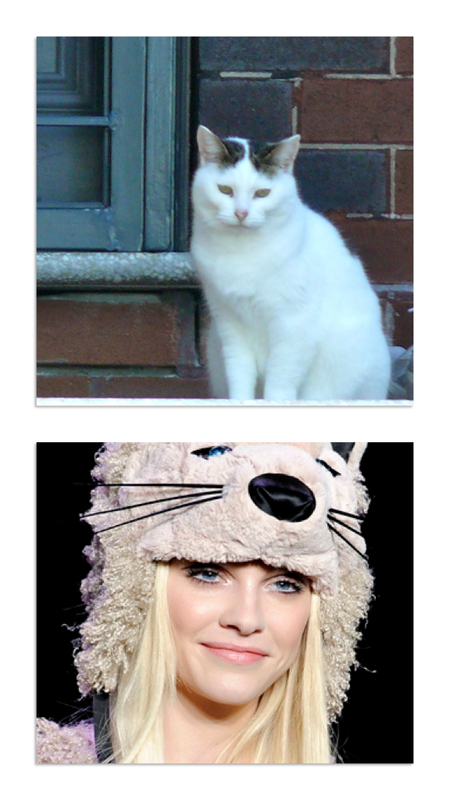 Love your photo match-ups. Hope you’re feeling better now that the New Year is older. January is more than half over. It’ll be December before you know it, and I haven’t even started my Christmas shopping yet. Don’t freak me out, Patti. 😯 Hahaha. But you’re right – time just whizzes by. Resolutions are a recipe for failure and guilt. Maybe everyone’s resolution should be – JUST LIVE. We do put too much pressure on ourselves! you have an amazing eye selma! What a delightful way to start my day…thanks for the smiles. You are so welcome, slpmartin. I really appreciate your frequent comments. You brighten MY day. Thank you! 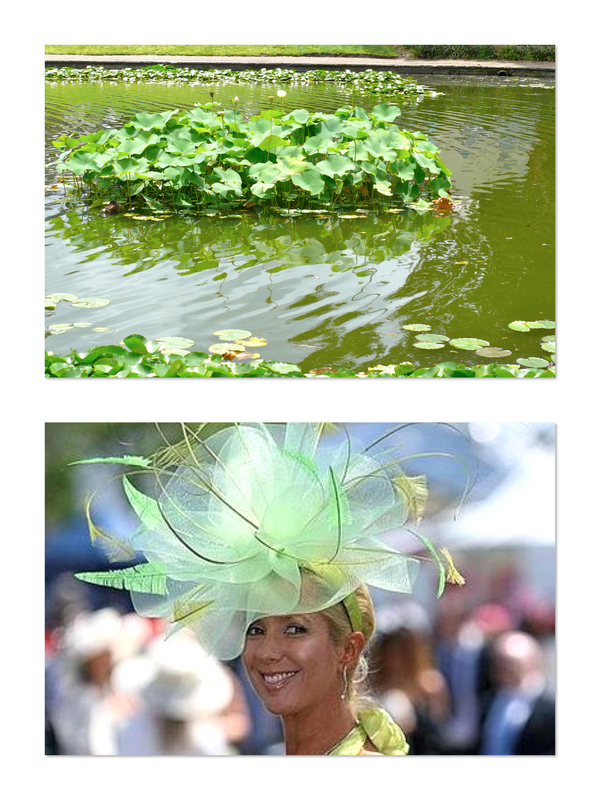 Bet even you would have trouble finding something in nature that looked like the hats worn by Princesses Beatrice and Eugenie. LOL! But then again, the cat one wasn’t expected either. Hi writingfeemail, so nice to see you. Those royal hats are very tricky. That one Beatrice wore to the royal wedding that looked like a brown bow on a present was wild. I couldn’t find anything to match that. I laughed and laughed trying to find something. Thanks so much for stopping by. Really nice. Love the cat hat. A little silliness goes a long long way. Who wouldn’t like a cat on a hat? Tres stylish. MIAOW!!! That building is a little freaky at night, Puddock. It looms. There is definitely something spooky about it! These photos are FABULOUS – and we all need SILLY when we are feeling low! Love you, Selma! Haha, I love the hat matching … it’s wonderful and fun. I think sometimes a new year is so full of expectation that it can become a little overwhelming … silliness is always a lovely relief from too much pressure. Thanks for the giggles. I love it too. It really does make me laugh. I am a big fan of being silly. Always gets me through the tougher days! I do think the German hat is the best one. It really is an amazing building. I don’t think I’ll ever look at it in the same way again. Great to see you, Tex!! PS – I’ve just seen the linky – thanks! I loved that slideshow you did of Sydney Harbour. Some fantastic shots in there. And I know a lot of people sneezing at the blossoms right now. They’re pretty but dangerous…..
Oh yeah. It hangs around like a noose around your neck. And of course, it is unrealistic to expect instant change as soon as the clock ticks over to a new year. It will happen but a little more slowly than anticipated….